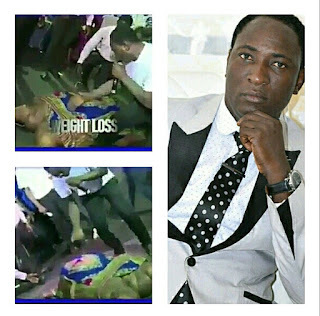 Prophet Jeremiah Omoto Fufeyin of Christ Mercyland Deliverance Ministries, Warri, in this video was shown praying for a very fat woman, the woman has been deterred from working as a result of the fatness. In our era of many pastors and self proclaimed Prophets, most especially in African continent, it is very difficult to know who to believe, except through a very sensitive discerning spirit. Praying for a fat woman to loss weight? No more questions, with God all things are possible, I think the pastor was trying to prove that Bible verse. The pastor was heard saying, "that spirit that reduces weight, reduce her weight", while his congregation was there watching what was about to happen.